-Don’t drink and boat. Boating is a great social activity, but the Marine Board encourages boaters and persons floating on the waterways, to leave the alcohol on shore. It’s safer for everyone. If arrested for Boating Under the Influence of Intoxicants (BUII), violators can be fined up to $6,250; can lose boating privileges for up to three years and even serve jail time. -Know what rules apply. “There are all types of watercraft on the market; some are considered boats and others are pool toys. Boats are designed differently, and by state law, have specific equipment requirements such as having enough properly fitted life jackets and a sound producing device, like a whistle. Attach the whistle to your life jacket and you’re set.” Massey adds. “If you plan to float the river, keep in mind that pool toys are designed for use in a swimming pool, have no directional control, and can puncture easily. -Wear your life jacket. Each boat (including canoes and kayaks, inflatable boats, Stand Up Paddleboards) must have a properly fitting life jacket for each person on board and at least one sound producing device, like a whistle. Life jackets need to be in good shape and readily accessible — not under a hatch or in its packaging. All youth younger than 13 must wear a life jacket when in a boat that’s underway. U.S. Coast Guard statistics show that over half of all boating fatalities occur with small boats on calm waterways, in shallow water and sunny conditions. -Sit on the seat. The growth of wake surfing is luring many people to ride on the swim platform, stern, sides and the bow of unenclosed boats. The stern can be a dangerous place for exposure to carbon monoxide and a prop-strike safety hazard. It is illegal to ride on the bow, decks, gunwales or transoms of a motor boat when the boat is underway. Sitting on designated seats is the safest option –especially when the boat is towing someone. -Slow down and keep a sharp lookout. Know the boating regulations for your area of operation. Always obey the “slow no-wake” buoys or signs. Boaters are responsible for their wake –including PWCs. Remember to slow down within 200 feet of a dock, launch ramp, marina, moorage, floating home or boathouse, pier or swim float. Be courteous with one another and share the waterway. Paddlers need to stay closer to shore and not operate in the main channel. Cross only when it is safe to do so. Marine officers will be on the water to assist boaters and help keep the waterways safe. The top violations so far this summer involve not having life jackets or children under 13 not wearing a life jacket, excessive speed, unsafe operation, failure to maintain a proper lookout, riding on the gunwales, deck or transom when a boat is underway, and overloading. 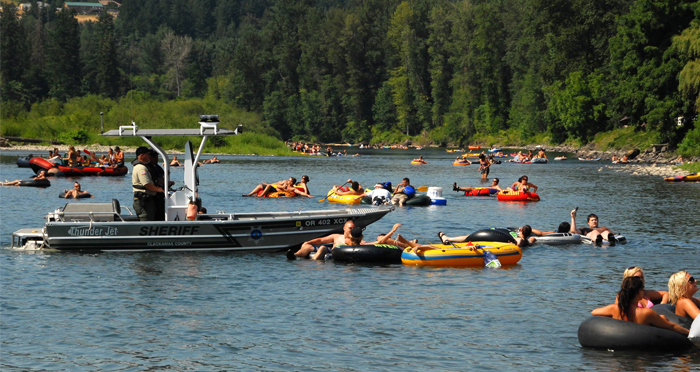 For more information about equipment requirements, regulations and ideas on where to go boating, visit www.boatoregon.com. BOAT: All watercraft, including a seaplane on the water and not in flight, used or capable of being used as a means of transportation on the water. Exemptions include: boathouses, floating homes, air mattresses, beach and water toys or single inner tubes. “Boats” are required to carry specific equipment based on the type of boat and boat length. SLOW-NO WAKE: Operating a boat at the slowest speed necessary to maintain steerage and that reduces or eliminates waves that appear as white water behind the boat.